In the wake of Wynn Las Vegas odds maker Johnny Avello's transition to DraftKings, there's a void in the market of available 2019 Kentucky Derby odds from domestic casinos. But the offshore gaming website Bovada.LV opened wagering this week on a number of promising 2-year-olds. No surprise here: Bob Baffert's barn looks loaded again. 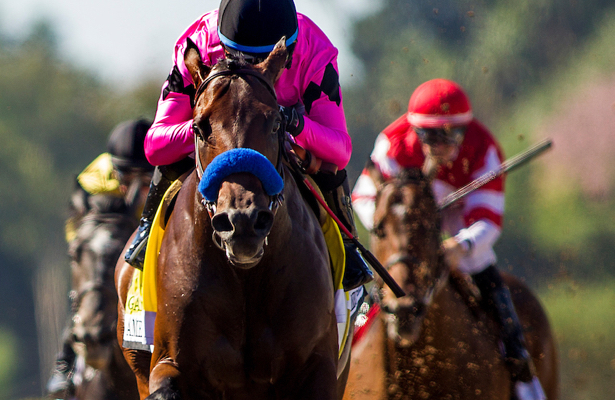 Baffert trains three of Bovada's top five choices led by Game Winner, the Breeders' Cup Juvenile hero listed as the early 8-1 Kentucky Derby favorite. The others are Coliseum and Improbable, both 20-1. The former is an un-raced Godolphin runner working consistently in California, while the latter won a stakes impressively on last weekend's Breeders' Cup undercard. Top choices not in Baffert's care include Instagrand, the Grade 2 winner freshening up for a 3-year-old campaign. He's 16-1. Knicks Go, the Breeders' Cup Juvenile runner-up, is 20-1. Among others on the list, Baffert also trains maiden winners Mucho Gusto (25-1), Roadster (25-1), Tale of the Union (33-1) and Magic On Tap (40-1). But also, about Bovada: It is an unregulated offshore entity that doesn't operate under the same laws as domestic, brick and mortar casinos. As opposed to when you bet into pari-mutuel pools, money here doesn't go back to horsemen either as it will later this month when Churchill Downs hosts the first pool of its official Kentucky Derby Future Wager. The list of wagering interests, though, checks out, with some potential value available on a few horses in particular. Shug McGaughey-trained Code of Honor scratched from the Breeders' Cup Juvenile the morning of the race due to a fever. He's well-regarded, but lightly tested and remains 33-1. Meanwhile, Maximus Mischief, who owns the crop's top Beyer Speed Figure and has looked like a monster at Parx Racing, sports the same price. Royal Marine, a Group 1 winner on the grass, could take the UAE Derby route to Churchill Downs, and he's 40-1.